« Forget Sam-I-Am & Friends, This Girl is Picky! Is it just me, or is Eloise the only one her age still in diapers? “She’ll let you know when she’s ready,” they’ve told me. Until now, I’ve used those reassurances as a free pass to avoid the issue altogether, mostly because I was too tired taking care of a baby to start cleaning up accidents. But Baby is now a toddler, and Eloise is 2 ½. I guess I’m a glutton for punishment: We weaned Charlotte off the bottle last week, so throw whatever’s next at me – I’m ready! My “Guide to Toilet Training” is in hand, “Elmo’s Potty Time” is in the DVD player, there’s an enormous sticker chart on the bathroom wall and a bounty of rewards to be claimed upon Eloise’s first success: a new Backyardigans DVD, Cars stickers and more M&Ms than she ever knew existed. “Is it a rhino passing some gasses? 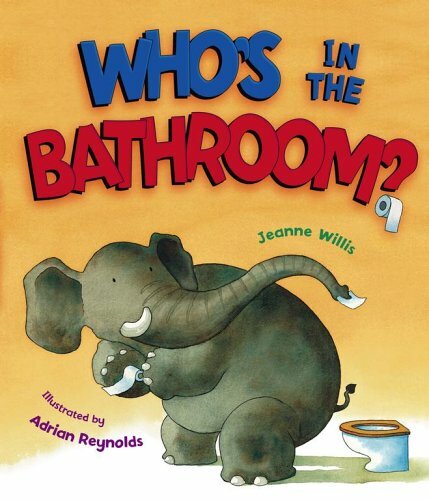 Willis’ punchy rhymes are accompanied by Adrian Reynold’s cartoon-like illustrations, popping with color and depicting, at times, somewhat repulsive scenarios: a monkey washing his feet in the bowl and a cat “sailing off to a city of yuck.” I suspect only the parents of young children can truly appreciate this “toilet humor;” when else do we talk so openly and unabashedly about pooping and peeing, piddling and widdling? More than anything, I guess I was just surprised Diane found this to be the most offensive image. 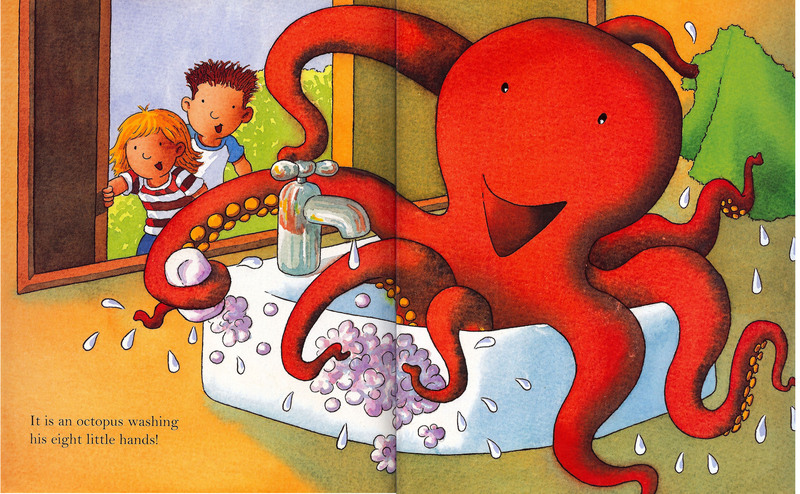 It is an octopus washing his eight little hands!